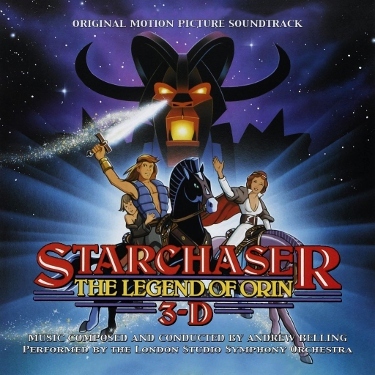 If not for the existence of a little franchise called Star Wars, Steven Hahn's Starchaser: The Legend of Orin (1985) probably wouldn't exist at all. It owes almost as much to George Lucas' original film as Grizzly does to Jaws, a near carbon copy that doesn't feel like it has any right to exist. But somehow, it's still a fun adventure: billed as one of the first feature-length animated films produced in 3D (and with early hints of CGI to boot), this is a familiar yet confident clone that's perfectly enjoyable once you let your guard down. The plot is a joke, though. Our story begins on planet Trinia, where evil ruler Zygon (voiced by Anthony De Longis) forces human slaves to mine for crystals in dangerous underground caverns. One of the younger men, Orin (Joe Colligan), digs up a mysterious sword that projects the image of an old man who speaks about a world above. Having never left the confines of their mine, Orin and his girlfriend Elan (Noelle North) heed the old man's words; an easy decision for her once a robot guard murders her grandfather (Herb Vigran). She doesn't make it out thanks to Zygon, but Orin digs for the surface and discovers a strange world filled with dangerous creatures. He's saved by rogue pilot Dagg Dibrimi (Carmen Argenziano) -- who literally chews on his cigar for the entire movie -- and they're eventually joined by a fembot named Silica (Tyke Caravelli) who Dagg reprograms through, um...unconventional means. Naturally, Orin wants to mount an offense and free his people from Zygon's wrath, but ol' Dagg only seems interested in freedom and profit. That's just the tip of the shitberg...but the more Starchaser goes on, the more enjoyable it actually gets. Despite the entirely obvious similarities to Star Wars in overall tone, plot, and characters (which also includes a princess attracted to Orin, who would've probably been his sister had a sequel been made), there's an infectious charm that makes it fun to watch. A big reason is the lean towards PG material -- probably closer to PG-13, by today's standards -- that makes Starchaser feel less like a kid's film (it's advertised as being "for the whole family", but I'm glad I watched it myself first). Also of note is the respectably good animation: it's partially rotoscoped and, as mentioned earlier, even includes some rather impressive early CGI that gives spaceships and other vehicles a pleasing amount of depth that still looks good today. It tanked at the box office -- and rightfully so -- but still deserves its cult status, as it's a great deal of fun in the right mood. Whether you're laughing at Starchaser or with it, it's anything but an ultra-serious bore. Although I'd have believe it if Starchaser was never put on home video until now, the film actually has a pretty substantial history that includes VHS, laserdisc, an obscure format called VHD (in 3D, no less), and even a now out-of-print DVD from MGM back in 2005. The legacy continues with this new Blu-ray from Fries Film Group...but don't get excited, because it's a missed opportunity in almost every department. Featuring a compromised A/V presentation with no 3D option, mono audio, and no extras, it technically looks better than the DVD...but that's about it. Had a better distributor secured the rights to this one, fans would finally have a definitive disc. Despite the existence of a recent 3D digital master that was screened in theaters, Fries Film Group presents Starchaser in a 2D 1080p transfer that feels kind of...neutered. There are positives, of course: the Blu-ray is objectively a solid step above MGM's 2005 DVD, which was in really rough shape and featured questionable framing of the film's original 2.35:1 aspect ratio. It's unknown if the Blu-ray uses better source material, but this is undoubtedly a different looking presentation. Although there are several moments of softness, obvious print damage, digital noise, inconsistent black levels, and occasional banding and compression artifacts, many scenes look great with solid image detail, vivid color saturation, and a satisfying smoothness that isn't loaded with heavy noise reduction. Still, this is a slightly below-average transfer overall, especially since a (presumably) stronger -- or at least theatrically accurate -- version is available. The fact it wasn't used for this Blu-ray is beyond frustrating...but wait, there's more where that came from! Unlike MGM's DVD, which included the film's original stereo soundtrack, Fries Film Group serves up Starchaser with an underwhelming 2.0 mono mix. Lossless or not, it's inexcusable treatment of a film that ought to sound better than it does here: while dialogue and background noises are relatively crisp and balanced, it can't help but have a narrow soundstage even when artificially spread to the left and right channels. The music achieves a few moments of depth but would likewise benefit greatly from a stereo bump. Again, I highly doubt that better source materials weren't available; hell, I'd have taken the DVD's Dolby Digital track over lossless mono. In fact, the only effort made here is the addition of optional English SDH subtitles, which weren't included on the DVD. Not much to the interface -- just access to chapters and subtitles, but at least there are no forced trailers. This one-disc release arrives in a keepcase with double-sided artwork and a front cover based on an original poster (although with the tagline added, it makes Zygon look like the hero). The lenticular slipcover is similar to MGM's DVD cover, and it's the only thing "3D" about this release. No extras here, not even a trailer. It's not like MGM's DVD had extras either, but just one more disappointment about this release. 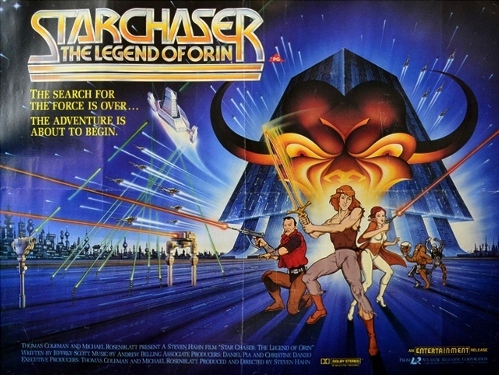 Steven Hahn's Starchaser: The Legend of Orin rightfully flopped at the box office back in 1985 -- it's such a blatant rip-off of Star Wars that it almost has no right to exist. But I'm glad it does, because it has an obvious outsider charm, boatloads of confidence, and some great visuals including early CGI that makes the spaceships and other vehicles look surprisingly good. It's also noteworthy for being one of the first feature-length films produced in 3D, which likely adds to its overall fun factor and effectiveness. Sadly, Fries Film Group's Blu-ray package is a disappointment in every category: it lacks a 3D option (even though one exists), the original stereo mix (which not only exists, but was included on MGM's DVD), and absolutely no bonus features. With the right treatment, this could've been one of the year's best surprises; instead, it's just a stinging disappointment. Die-hard fans may want to indulge, as it does look quite a bit better than MGM's DVD. But there's so much wrong with this Blu-ray that it's almost worth ignoring outright. Rent It.